We’re busy filling the template directory with popular forms that you can customize with your branding and embed on your website or send directly to clients. 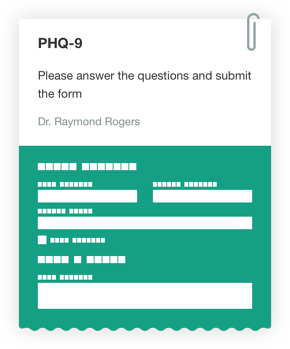 We received many requests for the PHQ-9, so it is the newest addition to our Hush Secure Forms template directory. For those unfamiliar with the questionnaire, the Patient Health Questionnaire (PHQ-9) is a self-reporting tool that screens for symptoms of depression. The form starts with the question "Over the last two weeks, how often have you been bothered by any of the following problems?" The questionnaire then goes on to list nine scenarios with the option to respond according to the level each scenario affects the respondent's life. Our PHQ-9 delivers a score to the practitioner upon completion so they can access the results and be ready to discuss them at the next session. Take a sneak peek of the Hush Secure Forms PHQ-9 before its official release. The PHQ-9 is just one calculated scoring questionnaire that will be available in our template directory. Be on the lookout for forms such as the GAD-7, which screens for anxiety disorders, and the ASRS, an adult ADHD screening tool. In time, we hope to include most commonly used screening tools as forms in our template directory. If you don’t see the form you want, let us know, and we’ll look into adding it. In the meantime, you can build a customized version of the form you need with our drag-and-drop form builder. It’s easy to use and will be included with all of our Hushmail for Healthcare subscriptions very soon. Don’t have a Hushmail for Healthcare subscription? Try Hushmail for Healthcare for $9.99/month, risk-free for 60 days. What else would you like to see in our template directory?